When I used to run my small nursery some years back and attended plant fairs, the commonest question was always 'Is it hardy?' For those of us that dabble in exotic plants, this is a very real consideration. Dare we plant it? Will it need wrapping in the winter or must we transport it to a greenhouse? Will it still be alive next year? The thrill of growing something lush, leafy and exotic in a chilly climate will always be a gamble with the successes often heavily balanced with the disappointments! But we still do it! 'Never say a plant isn't hardy until you have killed it three times' was the maxim of one optimistic but now sadly departed, gardener I knew! Tetrapanax papyrifer from Taiwan - one of my favourites but borderline hardiness in many areas and often cut back to the ground by hard winters, Fortunately it will regenerate from its roots. 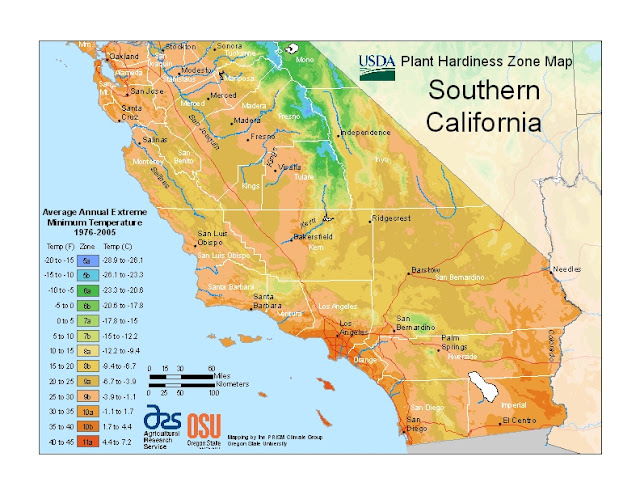 Yesterday's newspaper included an article announcing a revision by USDA to the zone system used to divide up the USA into growing zones. This is the first revision since the system was developed in 1990. Most gardeners will have seen those little Z symbols in gardening books. Global warming has meant that the pattern of winters in many areas is not so cold as it used to be. The new map is based on data collected over the period 1976 to 2005. 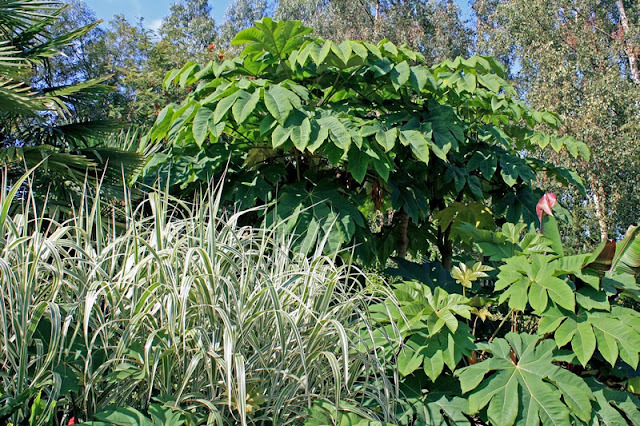 The Z ratings of plants remain the same but some geographical areas will have changed their zone, meaning that gardeners will be able to try species that in the past hadn't been recommended for their area. Although this is most commonly used in the USA, Europe and various other countries have adopted the scheme to a certain extent with the UK sitting between zones 7 -10. In the UK, Nottingham sits in Zone 8 whereas in California, my Palm Springs garden is still in Zone 9b. This reminded me that the revered RHS debated hardiness last summer and in its own inimitable way, came up with its own hardiness scale. Confusingly, the RHS system bears no relevance to the accepted and well established USDA zone system. 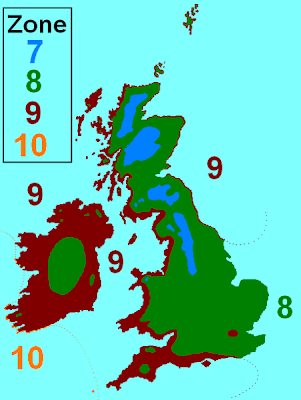 The RHS argued that the UK, being a small island needed a more precise system and has developed a scale from H1 to H7. Under the RHS scheme the UK sits between H3 to H7 which is three increments. Under the USDA system , Z7 - Z10, there are again three increments but when we consider that the USDA system regularly splits those into 'a' and 'b' subzones, we have six sub divisions - surely enough for our small island! But the RHS, knowing its world superiority, established its own system. (Said with tongue in cheek!) The following is my attempt to rationalise the various systems. Comments welcome! Now I have been very good and not bored you with my running exploits so far but today I'm very pleased with myself, I've just completed a 12 mile training run and with just two weeks to the local half marathon, I'm right on course. I took a new route and enjoyed the fresh gardens, making a mental note to return later this weekend with my camera to capture a few things. The race here is quite amazing with lots of veteran runners such as myself. Last year I saw one amazing old guy, bravely plodding around with his walking stick! What a tough old bird - or does it once again come down to another sort of hardiness?